The S.S. Sweet Sailboat has reached its destination and I didn’t fall overboard once! I cut each piece of taffy into 5 pieces and formed each piece into leaf/triangle shapes. I believe it works better if you cut smaller pieces (about 10 pieces per candy) and flatten them out … which will result in thinner leaves. 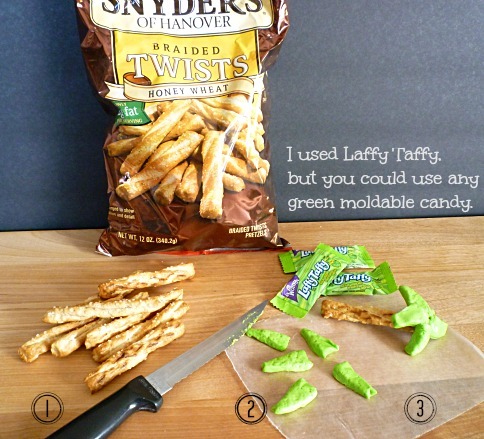 Arrange the leaves on one end of the pretzel … you will need to press the taffy to make it stick to the pretzel. Make the sand – Mix 1/2 cup granulated sugar with 1 teaspoon cinnamon. 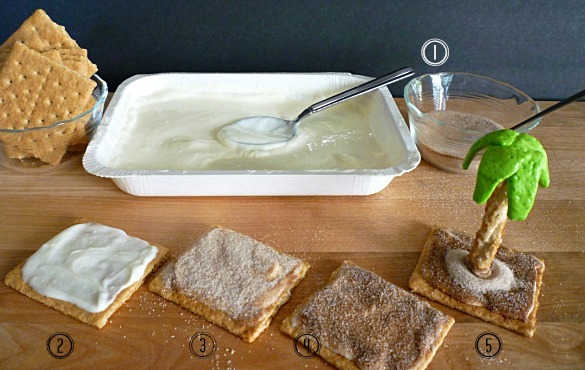 Spread some melted white candy over a graham cracker. Cover the melted candy with the sugar mixture and chill for a few minutes. Pour excess sugar mixture back into the bowl. While the graham cracker is still cold – attach palm tree by dipping base into melted candy, hold in place, sprinkle more sugar on melted candy … hold still until palm tree is attached. Shake extra sugar back into bowl. Your palm trees remind of my trip to Mexico. My exchange student had a sculpture created by a local artist and he made palm trees that look so similar to yours for on the sculpture. What a fun treat to serve at a beach or pool party. Thank you Beth 😉 I sculpt with candy … we eat the mistakes, LOL! These are so cute. I checked out Summer part 1 and they are a great idea for a swim party~Thanks! Palm trees are a nice addition to the boats and Sugar Island is the perfect name. Does Laffy Taffy come in brown? – I’m thinking coconuts for the palm trees. If Laffy Taffy is not sold at our local stores, what are some of the other moldable green candies you mention? Always good to have a Plan B. Feel like heading to the beach right now. Nope – you don’t want me proofreading – I SAW the graham crackers, but didn’t even notice they were missing in the list of ingredients. Me again – I just reread the instructions but can’t figure out where the pretzel squares were used when making the palm trees. The short pretzel rods make the trunk of the tree, but the pretzel squares I can’t figure out. Help. 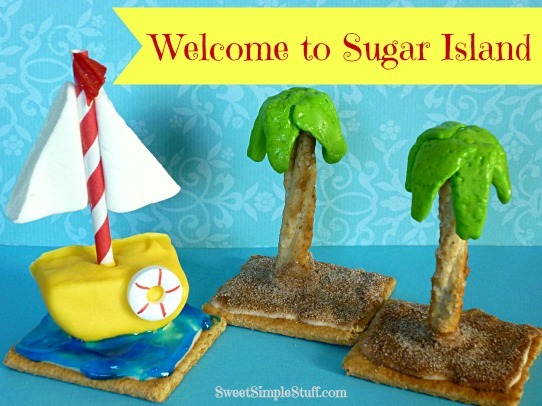 I love palm trees, these are so cute and Sugar Island is a perfect name. what cute little palm trees along with great inspiration. Oh, my goodness; you got my head in a tail spin. using rolos for tree trunk stacked on plastic or wooden skewers and stuck in cake or could use giant Tootsie Roll as the trunk. for coconuts; brown fondant balls fondant for leaves as well. Sorry; thinking out loud again. Didn’t mean to get carried away with my thoughts. Thank you Colleen … thinking out loud is a good thing 🙂 I love the idea of using Rolos for tree trunks! Brenda, you clever girl you… Part 1 I was impressed by the blue water. Part two, I’m really liking the sand.